Reviews | Romance Or Not Romance? I can’t remember when I bought this book (maybe in my early-twenties) but I do recall attempting to read it in the past and abandoning it pretty quickly. I’m not sure why – maybe it wasn’t what I was expecting at the time. Anyway, I’m really glad that I finally got around to revisiting ‘The Country Girls’ because I found it a very easy and enjoyable read. The first thing to say is that it’s a short novel but this is no bad thing as you get into the story very quickly and the main characters are very striking. While ‘The Country Girls’ is set in a rural Ireland belonging to a bygone age, the relationship between Caithleen and Baba seems very modern, particularly in Baba’s relentless dominance and abuse of her more socially vulnerable friend. I enjoyed the fact that Baba was a far less sympathetic character than Caithleen. I felt that the most intriguing aspect of ‘The Country Girls’ was the ambiguity surrounding the first person narrator, Caithleen’s point of view. As this is the first book in a trilogy, perhaps one needs to read the later books to gain a clearer perspective on Caithleen’s real feelings about certain aspects of the past. But from this book alone, I was left feeling unsure about Caithleen’s view of her relationship with ‘Mr Gentleman,’ an older, solvent, married man. The relationship reads as having been exploitative and yet the narrator’s presentation of it appears naïve as Caithleen’s own adolescent interpretation of it was at the time. So the narrator doesn’t appear to be distanced from this episode, whereas she does seem to have an adult perspective on most of the rest of the story she tells. I don’t know whether this is a flaw or a strength of the novel but it was something that left the narrative feeling unresolved. 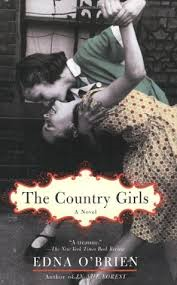 Overall, I would recommend ‘The Country Girls’ to anyone looking for a relatively short but absorbing read.